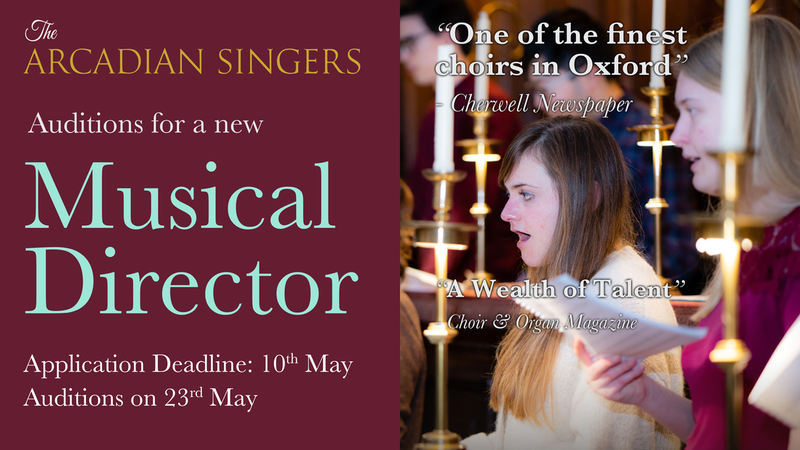 The Arcadian Singers of Oxford invite applications to the position of Musical Director for the 2019-20 academic year. An independent, auditioned chamber choir with a distinguished 40-year history, the Arcadian Singers present at least one concert a term, alongside other musical engagements including national tours, workshops, CD recordings and radio broadcasts. The choir rehearses once a week on Thursdays during term time. More information about the choir and its repertoire, including details of previous concerts, can be found on the Events page and social media. Promoting the choir in Oxford and further afield. The post is intended to run for one academic year (October 2019 - June 2020) with the option of renewal by mutual agreement. ​Good keyboard skills are considered an asset. To apply, please email arcadiansingersoxford@gmail.com with a CV detailing relevant experience, together with a covering letter explaining your suitability for the position and a sample concert programme. Applications will be accepted until Friday 10th May (Trinity Week 2). Shortlisted candidates will be notified by the following Friday. Auditions will take place on the evening of Thursday 23rd May (Trinity Week 4). Candidates are asked to keep this date free. Please note that The Arcadian Singers is a student-run society with no funding from the University or City and that the role of Musical Director is pro-bono, though all reasonable expenses, including travel, will be paid.